Today as I wade through my co-worker’s copy of Nicholas Carr’s The Shallows: What the Internet is Doing to Our Brains, I keep thinking about just what makes the book superior to any electronic form. You see, I’ve resisted buying a Kindle, Nook, or I-Pad longer than most folks. 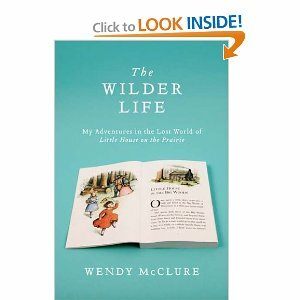 My most recent literary love affair has been with a paper copy of The Wilder Life: My Adventures in the Lost World of Little House on the Prairie by Wendy McClure. This book brings back so many memories—my own love of the Little House books and how I could so easily escape into “Laura’s world.” You see, like McClure, I, too, imagined myself making candy by boiling maple syrup and pouring it onto snow; I, too, had wanted to help Pa make those twists of hay that kindled the family’s fires; and I, too, had wondered how on earth Ma could feed her starving family on nothing more than a bag of wheat during the Long Winter. Thanks to McClure, who does all these things herself and more, I think I now understand why Ma sometimes seemed to be in a bad mood! As she retraces the steps of Laura’s life, McClure takes us on an enchanting journey behind the real story that leads her on some interesting adventures of her own, from sleeping in a covered wagon during a hailstorm to participating in a homesteading experience hosted by some “kooky survivalists.” If you are a Little House fan who’s ever suspected that the real story may not have been the saccharinely sweet version portrayed by Michael Landon, this book is for you. Ever wondered why the Ingalls family moved around so much? McClure does her own detective work and reveals that Charles Ingalls may have been skipping town for a reason. And did you know that the Ingalls family had once included a baby brother named Freddy who died tragically young? And have you ever wondered about the relationship between Laura and her only surviving child, Rose Wilder Lane? It’s a lot more complicated than I ever thought. So the real story wasn’t as pure and simple as the books led us to believe, but that knowledge doesn’t diminish my appreciation of the Little House books one bit. It brings Laura’s story to life even more, told through the lens of an author who also admired Laura and longed to experience a fragment of Laura’s life herself. While McClure’s book is nonfiction, her story underscores the role of fiction in our lives. Her book reminds us of the beauty of novels and the importance of letting oneself enter the world of an author and feel something felt by someone besides ourselves. As Carr so painstakingly reveals (with neurological evidence to boot), our brains are being reprogrammed to resist the urge to lose oneself in a book thanks to the “ecosystem of interruptions” surrounding us. Who would have thought that my mother’s torment (“Don’t think you can lose yourself in a book today, Missy; we’ve got chores to do!”) might one day be physically impossible? With a nod to Laura, this tragedy is a little bit like waking up one day and finding the wheat field of your mind destroyed by locusts. This entry was posted in Uncategorized and tagged carr, malcolm gladwell, nonfiction, novel, social discipline, the shallows, the wilder life, wendy mcclure on May 27, 2012 by Ashley Memory.